I thought it would be really interesting to look back on some of my own family's old photographs and do a blog post about them, what they mean to me and how important they are as a representation of your past, family resemblances and memories. So I spoke to my mum and my grandma (on my dad's side) and asked if they could show me some of their older photographs and talk me through who was in them. Well, I saw both of them yesterday and I was just overwhelmed by the number of photographs that they have and the stories they have to share about them. I thought I would enjoy looking back and simply seeing what my ancestors looked like, but I was so excited to see them all, from the formal baby photographs, some taken in such a similar way in some respects to what we still do today and the snapshots of captured moments that they managed to take, process and hold on to. I didn't even realise that my grandad really enjoyed photography in his younger years and has kept a lot of the negatives. Needless to say, I spent over an hour with my grandma listening to stories and we barely got through one box. This may be a bigger project than I first anticipated! This was my dad at Christmas in 1953. It was taken at my grandparents' council flat in Chell Heath, Stoke-on-Trent. 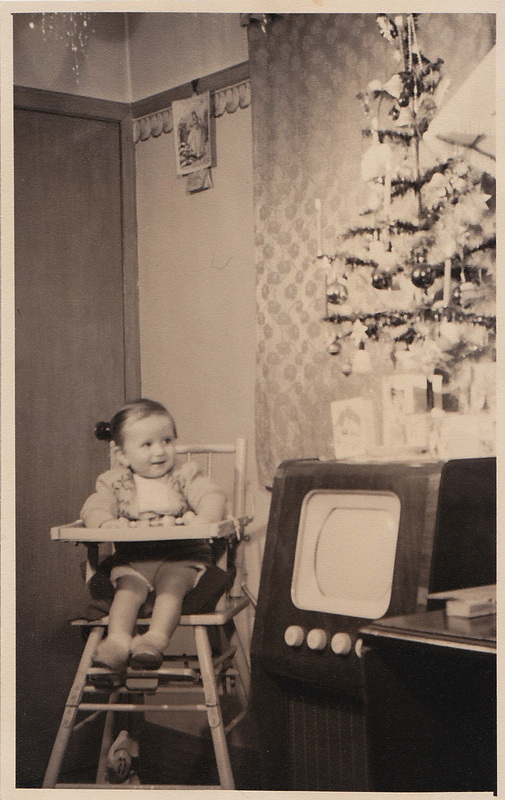 He's sitting next to the TV 'console' (as my grandma says they were called), which was apparently bought second-hand in an auction after it was salvaged from a house fire. Not many people had a TV in their home at that time, so they invited the neighbours over to watch the Queen's Coronation earlier that year. How thing's have changed in 60 years! Also, they are real candles on the Christmas tree and yes, they are lit! My grandma seemed surprised that I was shocked at this! Look out for more in this series in the coming weeks. Click here to go back to the top of this post.